Version 2.0 of CBS’s new Monday didn’t accomplish much. CBS: KEVIN CAN WAIT remained at 1.2. 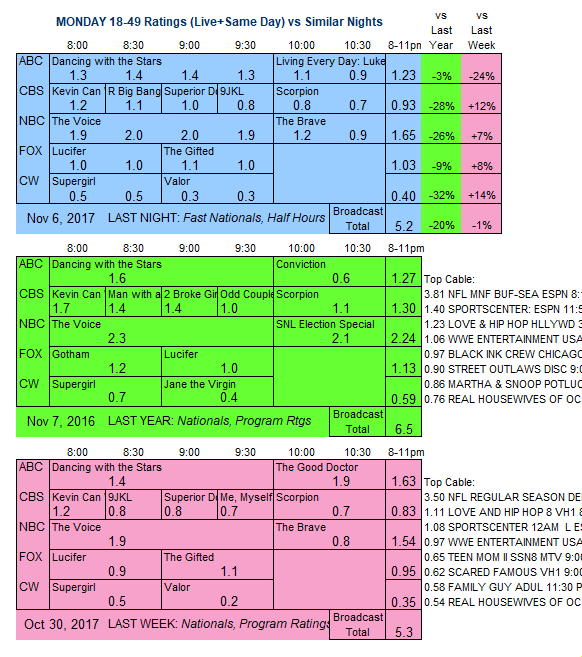 A one-time rerun of THE BIG BANG THEORY (MAN WITH A PLAN returns to that slot next week) elevated 8:30PM to 1.1, and that boosted SUPERIOR DONUTS by 0.2 to 1.0, but 9JKL, switched to 9:30PM, stayed at last week’s 0.8, up just 0.1 from last week’s all-but-canceled ME, MYSELF & I. SCORPION gained 0.1 to 0.8. ABC: MONDAY NIGHT FOOTBALL preempted the network in both Detroit and Milwaukee, so adjustments will follow this afternoon. 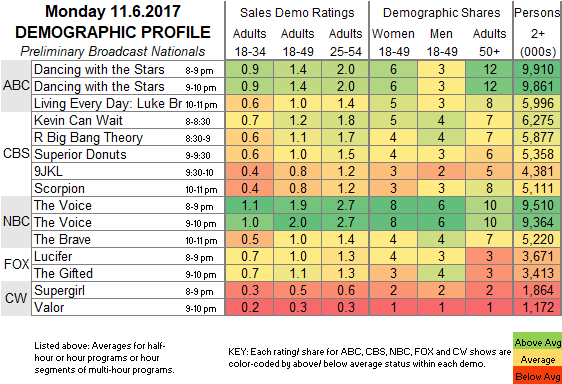 For now, DANCING WITH THE STARS is steady at 1.4, and a LIVING EVERY DAY: LUKE BRYAN special was slightly over half THE GOOD DOCTOR’S rating at 1.0. NBC: THE VOICE edged up 0.1 to 2.0, and THE BRAVE was up 0.2 to 1.0 (although it probably began at 10:01PM, so may be adjusted downward). FOX: LUCIFER was up 0.1 to 1.0, and THE GIFTED stayed at 1.1. CW: SUPERGIRL stayed at 0.5, and VALOR was up 0.1 to 0.3. Tonight features a pair of cable premieres: THE LONG ROAD HOME on NatGeo, and DAMNATION on USA.